What Is the Prophetic Significance of the Scotland Unity Vote? Just a few days ago, the people of Scotland voted to reject independence and remain united with the United Kingdom of Great Britain and Northern Ireland (the UK). This was a monumental vote that has been centuries in the making. When events like this happen in the world, God’s people need to stand up and take notice. Events such as this have significance; they herald the work of God. What is happening in the spiritual realm is unveiled in the natural realm. 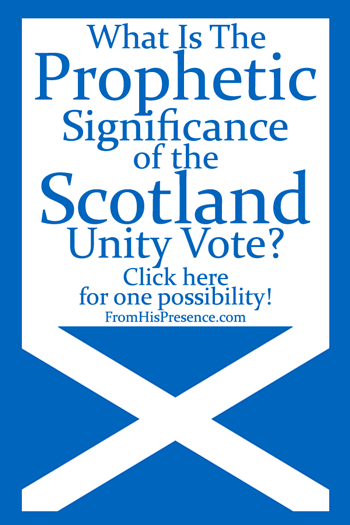 So what is the prophetic significance of the Scotland unity vote? 1. I believe God has downloaded an anointing for unity into the Body of Christ in Britain. If the British people will embrace the move of God, they will find it easier to be united than ever before. A great ability to love like God loves will rise up in their hearts, and His love will impact their nations. If you are holding onto any emotional wounds, offenses, bitterness, or unforgiveness, ask God to change your heart. Ask Him for the broken and contrite heart that He will not despise (Psalm 51:17). Release these sins, forgive those who have hurt you, repent of your agreement with the enemy, and ask the Holy Spirit to fill you where those things were. This is also a strategic time to align yourself supernaturally with godly covering. If you have not already done so, I implore you to find and be faithful to a Bible-teaching, Holy-Spirit-filled, local church. Join ranks with them and stand shoulder-to-shoulder, with one heart and one mind, in agreement with your church and leaders to fulfill the work of the Gospel. 2. I believe that tremendous revival is coming to the Body of Christ in Scotland and the entire UK. … poured out their lives for revival in Britain. Their sacrifices were not in vain. They saw tremendous fruit while they lived, but many of the seeds they sowed are still alive and buried in British soil today. I believe it’s time for those seeds to spring up. When I visited London earlier this year, I could feel the Holy Spirit moving there. I heard the worship and prayers for the nation in Westminster Abbey–prayers that have been going up for over a thousand years. They are praying the same way in St. Paul’s Cathedral and in thousands of other churches, chapels, and cathedrals across the nation, as well. If you’re not accustomed to church services that are founded in such strong history and tradition, you may criticize and think such worship and prayers were only rote. But you’d be wrong if you did so. The presence of God was so powerful there that I wanted to lay on my face and cry. The Holy Spirit is hovering and brooding over Great Britain. God hears the prayers of the British people over their nation, and He answers. Why else do you think this tiny island kingdom of the UK has been a world superpower for centuries? Why else do you think that a stable government has been preserved for centuries, despite some of the bloodiest wars in history being fought on their soil? Why do you think God has protected the British people from even more evil than they have already endured (such as potential Nazi invasion in World War II)? God has always answered, and He’s about to answer more. I believe that when the lion of Scotland (the lion being the symbol on the Royal Standard of Scotland, also known as the Banner of the King of the Scots) roared and chose unity, the Scottish people were echoing the roar of the Lion of Judah over Great Britain. In 1603, a lioness named Elizabeth, who was kept on display in the Royal Menagerie at the Tower of London, died. This event occurred when Queen Elizabeth I was very ill, and it was seen as a sign that Queen Elizabeth would also die… and she did. The lioness Elizabeth was a prophetic representation of what the sovereign of the nation, Queen Elizabeth I, would do. In like manner, I believe the vote of the Lion of Scotland represents what Jesus Christ, the Sovereign of the universe, is doing in the Spirit realm. The Lion of Scotland voted to preserve unity with the Kingdom. I am no expert on international affairs – just one woman who prays. But I believe we are soon going to see a great manifestation of the Kingdom of God in Great Britain. Related: The Most Important Article I’ve Ever Written: Does Heaven Move For You? Seeing so many youth morally corrupted …including in UK, I was really sad. But however, in God, everything is possible. Keep praying for people around the world – including europe, america, asia, africa, australia. The devil is roaring like a lion. But, may God keep his sheeps safe and his chosen people are wake up. Hi and thanks for reading! It’s true that the need is great, but God is stronger, and He has promised to pour out His Spirit on ALL flesh in these last days! I’m excited to see what He is going to do!